What is Hairprin Natural Hair Support? This is a review for Hairprin Natural Hair Support for consumer’s use. The maker of this product states that it has the ability to quickly stop hair loss, promote regrowth of hair, enhance blood flow to the scalp, and maintain natural hormonal balance to improve hair health. It is also said to rejuvenate and activate follicles in the hair. Keep reading to find out more about this supplement. Saw Palmetto – called the natural ‘Rogaine’, assists to reduce the DHT hormone that affects hair loss. Ginkgo Biloba – promotes proliferation of hair follicles and increases blood flow. Tocotrienol – the most effective form of vitamin E, for effective and significant hair growth. Fo Ti – an ancient anti-aging and hair loss prevention ingredient. Borage Oil – promotes thicker and more lustrous hair. MSM – boosts sulfur levels essential for strong healthy hair. L-Cysteine – sulfur based amino acid, critical for supercharged hair growth. L-Methionine – strengthens hair by forming chains of sulfur molecules that are an integral part of the hair structure. Biotin – also known as B7, plays a key role in cell proliferation, essential for hair growth. Vitamin A – powerful antioxidant to prevent hair loss. Vitamin B Complex – a fundamental element for hair, nail and skin health. Shown to trigger new hair growth and reduce hair loss. Zinc – key enzyme that works on a molecular levels to strengthen hair structure and promote rapid hair growth. Selenium – an essential trace element that boosts immune system and prevents oxidative stress, which can affect hair loss. Iron – low iron levels can affect hair loss, supplementation can ensure iron levels are not depleted. Copper – important co-enzyme to prevent hair loss and boost healthy blood flow. Iodine – balanced levels of iodine can reduce hair loss. Silica – improves blood circulation and is a key nutrient to help the body produce collagen. Folic Acid – beneficial for healthy hair growth. This product should be taken twice a day. If you want to experience the best possible results then you should take one capsule in the morning and one capsule in the afternoon. There are several different options you can choose from when it comes to purchasing this product. 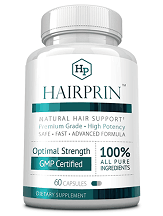 You can purchase a bottle of Hairprin or Hairprin Biotin for an extra boost of biotin for $49.95. You can save almost $50 if you purchase a bottle of Hairprin and one of Hairprin Biotin for $72.00. You can purchase two bottles of Hairprin and get two free bottles of Hairprin Biotin for $112.00 which saves you $127.80. Alternatively, you can also buy three bottles of Hairprin and get one bottle of Hairprin Biotin for the same price of $112.00. The largest package contains six bottles (three of Hairprin and three of Hairprin Biotin) in which you would then pay just $144.00 and experience the most savings. Since this an all natural supplement, there are no known side effects. The manufacturer gives a general warning that women who are pregnant, those with current medical conditions or are under the age of 18 should not take this or any other supplement unless they have discussed it with their doctor first. The manufacturer of this product provides a 60-day money back guarantee for any unsatisfied customers. If for any reason they are unhappy with the results of this supplement they can send it back for a full refund with no questions asked. They can contact customer service if they have any questions or concerns. Most customers experienced changes in hair loss after a week of taking Hairprin. Depending on their tolerance to the formula, they may start to show hair re-growth after taking it for about a week or so. The longest it should take for them to see results is 4-6 weeks. Hairprin is known to work stop hair loss and help regrowth faster than most products. Most of the consumers who have used this product saw results within 4-6 weeks after they began using it which is quicker than most products. The 60-day money back guarantee makes it more appealing to customers and gives them the opportunity to try the product risk-free before committing to it. There are a variety of different options available when it comes to purchasing this product which gives the customer a lot of choices without having to spend a lot of money. It is a very useful product that helps the regrowth of hair, cessation and prevention of hair loss without any unwanted side effects.